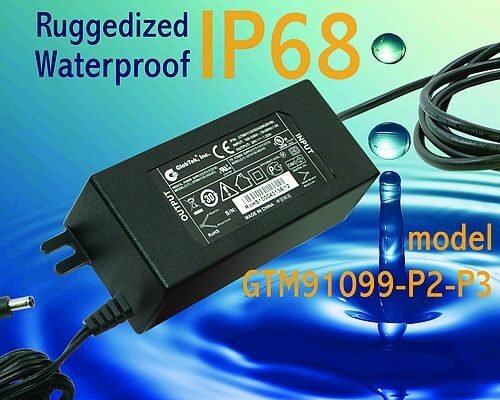 Continuing to pursue its commitment to quality products and service, GlobTek now has released it's IP68 rated desktop/external switching power supply Ac Adapter model series GTM91099-P2 -P3. The miniature ITE(60950-1), Medical (60601-1), and Household Use (60335-1) certified universal input switching power supply model GTM91099-P2 -P3 is available in a Class I, 3 Prong, IEC60320/C14 or in a Class II IEC60320 C8 or C18, 2 prong desktop freestanding configuration. Input alternatively available in flying leads of customer designated lengths and colors for hard wire applications. The tiny ITE (60950-1), Medical (60601-1), and Household Use (60335-1) power supply has an input from 90-264VAC 50-60Hz and a factory configurable output of 12VDC to 48VDC output with a max power of 60W continuous output. This product complies with North American Energy Star, Canadian NRCAN, and other worldwide requirements for Level V efficiency compliance and is produced in an ISO13485 certified facility. This family features regulated output with very low ripple, Built-in over current, Short circuit, Over current, and thermal protection as well as low leakage, low ripple, and high efficiency. The product is suitable for most outdoor and outside applications requiring DC power and common applications include utility metering, lighting, telecommunications, Portable instruments, medical devices, portable medical treatment and monitoring equipment and instruments, Hospital equipment and fixtures, equipment, and as a power source for Li-Ion battery chargers. Customized enclosure colors, housing designs, output cord types and lengths, as well as customized packaging available upon request.